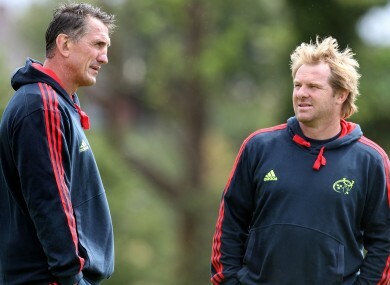 Munster's new coaching supremos - Rob Penney and Simon Mannix. THE NEW MUNSTER coaching staff are coming to the end of their first week of pre-season training but already the focus is on the big battles that lie ahead. Not all of those battles will play out on the pitch. Head coach Rob Penney fielded questions at his first press conference on Wednesday and the topic of getting full value for money out of his Irish internationals soon arose. The former Canterbury and New Zealand Juniors coach commented that he had great meeting with Declan Kidney on Tuesday, adding that their discussion was ‘very open and robust’. International players such as Ronan O’Gara and Donnacha Ryan will not return to the fold for some weeks yet but will feature in pre-season outings and the opening games of the RaboDirect Pro 12. Similar questions of player usage and game management exist in New Zealand, Penney added, so it was just a matter of finding a working balance for all parties. Penney, and new backs coach Simon Mannix, have vast experience in working with up and coming talents and, with the recent retirements of stalwarts such as Jerry Flannery, Denis Leamy, David Wallace and more, the Kiwi is ready to give youth a chance. I love to coach, being able to see the growth and development of young men, and hopefully watch them achieve their goals and aspirations is what excites me. Peter Stringer, BJ Botha and James Downey were some of the established stars training alongside young guns JJ Hanrahan and Luke O’Dea at Cork Institute of Technology yesterday. Paul O’Connell was also present but he trained on his own for the most part as he continues his rehabiliation from the knee injury that ended his season prematurely in May. Mannix, who made his All Black debut alongside legends such as Sean Fitzpatrick and Ian Jones, last coached at Racing Metro but says he is excited about his move from Paris to Munster. “I’m part of a club that has a wonderful reputation with huge respect from around the world,” he said. Email “‘Robust’ discussions between Rob Penney and Declan Kidney over Irish stars”. Feedback on “‘Robust’ discussions between Rob Penney and Declan Kidney over Irish stars”.